If you want to kill large numbers of people, you should seriously consider buying a handgun or assault rifle. As the movie-theater massacre in Aurora, Colorado demonstrated, chances are federal law enforcement and homeland security and counterterrorism agents won’t see you amassing an arsenal of assault rifles, handguns and ammunition. Longtime law enforcement and intelligence veterans say that the feds simply don’t have ways of spotting stockpiles of firearms. It stands in contrast to their successful post-9/11 efforts at stopping the spread of bomb precursors like chemical fertilizer. In short, one of the most useful tools for killing people is effectively excluded from the attention of federal agents who have received sweeping powers over the last decade to prevent mass-casualty events. “I don’t know of anything” about Holmes’ gun purchases “that would’ve notified law enforcement as a matter of policy right now,” says Jack Cloonan, a retired FBI counterterrorism agent. It doesn’t work this way with bomb precursor material. While there isn’t a government database of the stuff, the FBI and affiliated law enforcement agencies have spent countless hours convincing manufacturers, distributors and retailers to alert the authorities when suspicious or anomalously large purchases of chemical fertilizer or other potential explosives occur. “You would know a lot more about people who buy chemical fertilizer than people who buy firearms,” says Aki Peritz, a former National Counterterrorism Center analyst. “There are protocols in place, voluntary ones, for people to call in to the Department of Homeland Security” when potential explosives get bought in bulk, adds Cloonan. “Every time there’s an uptick in the terror warning, they have robust — and I mean robust — outreach” up and down the supply chain for potential explosives. Those alerts apply to people with criminal backgrounds or who are on terrorist watchlists, as well those who don’t. It doesn’t work the same way with firearms. There is no federal database of gun owners or gun purchasers. The Firearms Owners Protection Act of 1986 prohibits the feds from maintaining one. But there are a few exceptions that give law enforcement and intelligence and counterterrorism agents some visibility into private small-arms stockpiles. First, when someone seeks to buy a gun or rifle from a licensed gun dealer, federally mandated background checks will pick up if the suspected purchaser is on a terrorism watchlist. If so, his or her name will get sent to the FBI’s Terrorist Screening Center. That’s an internal Justice Department practice, not an alert that the gun dealer has anything to do with; indeed, the purchaser won’t know that his name resides in the data banks at the Terrorist Screening Center. However, people on terror watchlists can buy guns. Another exception, for those that aren’t on terrorist watchlists and don’t have criminal records: Someone seeking to buy two or more of certain kinds of rifles — semi-automatics; calibers higher than .22; detachable magazines — will attract the attention of the Bureau of Alcohol, Tobacco and Firearms (ATF) along four southwest states bordering Mexico. So will someone who tries to buy two or more handguns within five days, wherever the sale occurs. The ATF can retain information on those individuals for up to two years, if there’s no active investigation resulting from it. Several counterterrorism sources consulted for this story were unclear as to whether intelligence or counterterrorism operatives could access that ATF data. Ammunition purchases, however, are functionally unregulated and off-limits to federal law enforcement. The only way law enforcement would know about bulk ammo purchases is if the dealer decides he or she is dealing with a shady customer and alerts the authorities. By contrast, when convicted would-be subway bomber Najibullah Zazi emailed a contact in Pakistan who was under U.S. surveillance for ties to terrorism, an FBI agent near Zazi knew within hours. That agent’s home? Aurora, Colorado. This may help explain why the primary mode of mass murder in the United States in the post-9/11 world remains a single shooter using an assault weapon or handgun. 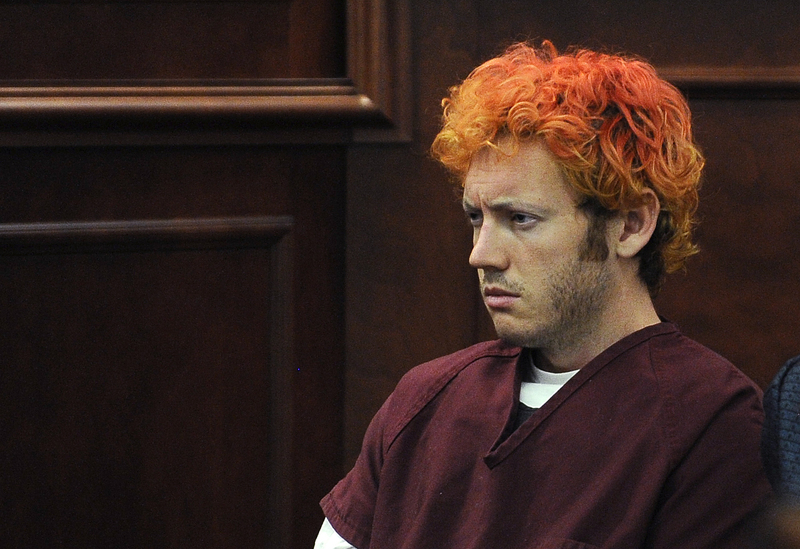 Holmes will soon face charges for shooting 71 people, at least 12 fatally, on Friday in Aurora. Nidal Malik Hasan, an Army major, used an FN Herstal 5.7 tactical pistol to kill 13 people and wound another 29 in his 2009 Fort Hood, Texas shooting rampage. Seung Hui Cho outdid them both: he killed 32 students and faculty members at Virginia Tech in 2007 before turning his gun on himself. Jared Loughner shot 19 people in Tucson last year, including U.S. Congresswoman Gabrielle Giffords. Update, 10:25 a.m., July 24: Text updated to reflect that information about multiple-rifle purchase only applies to certain kinds of rifles for sales occurring in four southwest states bordering Mexico.